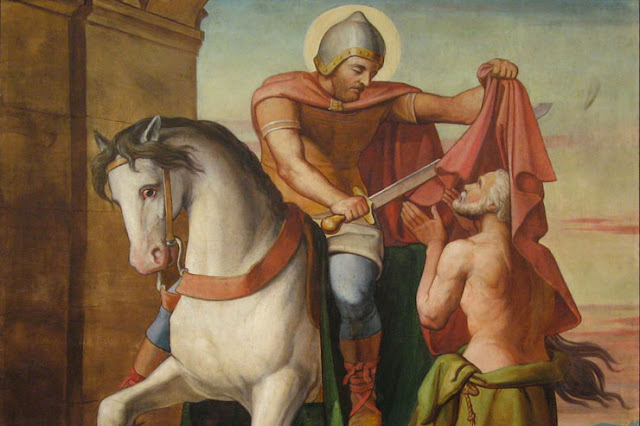 Today, November 11, we celebrate the feast day of Saint Martin of Tours (also known as “Martin the Merciful” and the “Glory of Gaul,” 316-397), bishop, and theologian. Saint Martin saw himself as a member of the “Army of God,” not the army of man. Zealous in his love for the Lord, he served (sometimes reluctantly, but ever obediently) those in need, and those who sought him out, for his eight-one years on the earth. Remembered for his great charity, Saint Martin inspires us still today to help those in need, as Christ would have helped them. Martin was born to pagan parents in Sabaria (modern-day Hungary). The family soon moved to Italy, where Martin discovered Christianity and entered himself into the catechumenate at age 10. Of course, his parents were greatly opposed to his conversion, and attempted to dissuade him, but by age 12, his love for the Lord was so strong, he wished to live as a hermit and devote himself completely to prayer and contemplation. His father, an officer in the Roman army, conscripted Martin against his will into the army when he was just 15, in accordance with a Roman law forcing the sons of veterans to enlist. Martin, convinced that his belief in Christ was in direct opposition to military service, refused to present when required, and was taken by force, in chains, to make his oath. Out of obedience, once his oath was administered, he felt bound to obey. Due to his reluctance to fight, he was assigned to a ceremonial duty, designed to accompany the emperor, and rarely saw combat. Martin became a member of the Roman army prior to his baptism, as preparation for baptism at that time took several years. However, by his active duty, he was basically living the life of a monk, rather than a soldier, much to the irritation of his fellow soldiers and officers in the legion. He was promoted to officer, and because of this was entitled to a servant. However, he insisted on switching roles with his servant, cleaning the servant's boots instead of the other way around! Here was a man words cannot describe. Death could not defeat him nor toil dismay him. He was quite without a preference of his own; he neither feared to die nor refused to live. With eyes and hands always raised to heaven he never withdrew his unconquered spirit from prayer. It happened that some priests who had gathered at his bedside suggested that he should give his poor body some relief by lying on his other side. He answered: “Allow me, brothers, to look toward heaven rather than at the earth, so that my spirit may set on the right course when the time comes for me to go on my journey to the Lord.” At his request, he was buried in the Cemetery of the Poor. 1. Our lives must be centered on God, not on self. 2. Our self denial is a prayer of the body to Our Lord Who came as an Infant to teach us and to redeem us. 3. Martin's act of cutting his cloak in two was both penitential and loving. All penances, if they are to have any merit spiritually, must be done in love. 4. We must be willing to give up anything and everything which keeps us from full union with God. 5. As soldiers of Christ, our struggle is to be against evil, not against others. We are always to be peacemakers as Martin was. Saint Martin, a member of the “Army of God,” is also known as the patron saint of soldiers. On this, veterans day, we turn to him with a prayer of intercession for the protection of all those serving in armed forces around the world. Lord God of hosts, who clothed your servant Martin the soldier with the spirit of sacrifice, and set him as a bishop in your Church to be a defender of the catholic faith: Give us grace to follow in his holy steps, that at the last we may be found clothed with righteousness in the dwellings of peace; through Jesus Christ our Lord, who lives and reigns with you and the Holy Spirit, one God, now and for ever.